In Salons, conference attendees gather in an intimate setting with an inspiring host to engage in lively and enlightening discussion of an intriguing topic. Commonly associated with French literary and philosophical movements of the 17th and 18th centuries, Salons were initiated at EPIC to bring more horizontal discursive space to our gathering, creating a forum for conversations that are on topic, but where attendees are not being presented to or workshopped. The spontaneity of interactions and serendipitous connections participants create at Salons make these events a conference favorite. Salon Registration: Conference attendees may sign up for specific salons at the registration table in São Paulo. Each salon is capped at 30 participants and sign-ups will be taken on a first-come, first-serve basis. Salon Readings: Each Salon description below includes suggested readings, selected by the hosts to provide helpful background and fuel discussion. Please try to do the reading for the salon you wish to attend in advance. The growth of an “internet of things” (IoT) means people are listening to their equipment with a finer ear than ever before. IoT has resulted in assets and equipment having stronger agency in the human-machine relationship, with these non-human actors in a stronger position to advocate for themselves with sometimes situationally meaningful, even high-resolution, data. In this salon, attendees will consider how ethnographic research can be used to create valuable experiences for consumers and industry, by making sure the goals of both humans & equipment as agents are better brought together. So bring your ‘war stories’ and your blue-sky questions! We would like a mix of IoT veterans and beginners. What are you doing in IoT? What would you like your organization to consider doing? What pressures are IoT experiences putting on the ‘humans’ traditionally studied by ethnographic methods? At the same time, what opportunities can be derived from IoT applications that could fuel ethnography into the future? …and weigh the role of ethnography in helping to deliver on these promises. If providing truly meaningful experiences is what will make IoT ubiquitous (like electricity) then the role of ethnography and anthropology can be significant. Whether the IoT device is mobile (a plane), in a fixed location (MRI machine), indentured to a biological organism (health and wellness monitors), or placed along a path where both humans and assets converge (smart roads & autonomous vehicles), these solutions have one thing in common: they are dynamic, time-based and unique to the situation. Let’s come together to discuss ethnography in its role of elucidating IoT’s always-on, always-aware, always-custom nature and identifying how to make the most of its potentials. 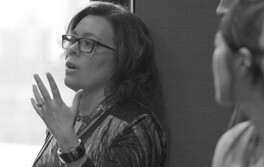 Suzanne Currie is a UX Strategy & Design Researcher at GE Global Research. There she applies her background in anthropology, experience design, and human factors to the design of industrial ‘internet of things’ enterprise software (used to predict and manage the health of ‘big iron’ equipment). Currie has an MA in cultural anthropology & museum science from the University of Denver and a BA in educational & industrial technology from the University of Maryland. Prior to GE, Currie worked for Samsung Research America, HGA Architects & Engineers, Medtronic, Brunswick, and The Hiser Group. Chris Massot is a Partner at Claro. He is a business leader and strategist, with a long history of guiding companies through the reinvention and evolution of their business. With more than 20 years in technology, product development, design, and manufacturing, Chris has helped create disruptive products and experiences such as the Microsoft Xbox, the Nike FuelBand, the Disney MagicBand, and NFL’s connected stadium. He has worked with Apple, Google, Starbucks, Samsung, and a host of startups on innovative products that have enhanced consumer experiences worldwide. See his EPIC Perspectives article Bridging the Gap between Ethnographic Practice and Business. At the most basic level, corporate strategy seeks to answer one question: where to compete and how to compete? This question should be an ideal match for ethnographers seeking to make sense of what’s going on in human worlds. Yet ethnographic research often struggles to have real impact on the big decisions taken by corporations. Why so? One hypothesis is the emphasis we place on traditional academic practice. While we talk the language of strategy and organizational impact, our tacit yardstick for success relates more to our self-image within the diaspora of social scientists and the pursuit of scholarly method. To demarcate the value of our discipline we tell a story of specialization. But this means our practice disappears into a black box, rather than becoming part of wider organizational culture. To make strategic impact we must be more willing to “getting our hands dirty”. This means working closely with the wider organization to figure out the best way of making ethnographic practice impactful for that specific culture: for example, in how it is positioned internally, how ‘participative’ it is, and the kinds of products it produces. In this salon we will explore together the creation of specific approaches that enable ethnographic studies to exert real impact on corporate strategy in different contexts. The focus will not be on anthropological methods, but on how to increase the impact of ethnographic work at a strategic level within different settings. To prime the salon we will discuss two case studies that highlight two different approaches. In one, a European carmaker views ethnographic work as a ‘science’ that only indirectly influences decision making. In the second, the leadership team of a global consumer goods brand is taking an ‘embodied’ approach to ethnographic research by engaging directly with fieldwork. We invite you to join our salon—bringing your own stories, approaches, and tips (both painful & pleasurable) of making ethnographic impact in organizations. Johannes Suikkanen is the Co-founder and Managing Partner of Gemic, a NYC and Helsinki based strategy consultancy helping companies to reimagine their role in people’s lives. Working at the intersection of business strategy and cultural analysis, Johannes has spent the last 10 years advising some of the most iconic consumer brands on growth and human centricity. Tom Hoy is a Partner at Stripe Partners, a global insight and innovation studio which is developing an ‘Embodied’ approach to strategy development. Over the last 10 years he has continuously experimented with research methodologies across a range of organizational settings. He developed the Made In Lambeth innovation network, bringing together multi-disciplinary teams to support local causes. Tom’s training in social sciences started at the London School of Economics. Similarly business practitioners frequently feel that classroom experience is valuable for their work or as a second career, but finding pathways to these kinds of opportunities are frequently difficult. We will exchange ideas that may help those wishing to seek teaching opportunities understand academic organizational structures and strategies for pursuing these goals. Theory in the social sciences can be an important component in practical research in the business world, but it is frequently ignored in these settings. In this salon we will encourage participants to share ideas concerning some key areas of modern theory that are underutilized in current business research practice, and suggest ongoing strategies for pursuing further study. Business and industry offer fertile grounds for academic research in the social sciences, but researchers in these disciplines do not often look to business settings to conduct their research. In this salon we will elicit ways in which business and industrial settings can be used in academic research programs to advance theory and human knowledge. Lisa DiCarlo, a PhD anthropologist and formerly a Professor of Entrepreneurship at Babson College, teaches in Sociology and the C.V. Starr Program in Business, Entrepreneurship and Organizations at Brown University. Tobin Nord is Director of the Carlson Ventures Enterprise Program, Carlson School of Management, University of Minnesota and co-founder of the Business Anthropology course of study at the University of Minnesota.